Suspected serial fraudster, Fred Ajudua, was remanded in Kirikiri prison custody yesterday by an Ikeja Special Offences Court for allegedly defrauding Ziad Abu Zalaf of Technical International Limited in Germany of $1.046 million. The court held that Ajudua will remain in prison custody pending the hearing of his bail application and commencement of trial today. The Economic and Financial Crimes Commission (EFCC) arraigned Ajudua before Justice Mojisola Dada on a 12-count charge bordering on fraud and conspiracy. According to the EFCC, Ajudua and his accomplice, Joseph Ochunor, defrauded Zalaf on April 2, 1993. The arraignment of Ajudua and his accomplices had suffered series of setbacks that led to 44 adjournments before several judges. The same scenario played out before Justice Josephine Oyefeso who took over the matter last year before the Lagos State Chief Judge (CJ), Justice Opeyemi Oke, reassigned it to a special court for accelerated hearing. In the fresh charge filed before the court yesterday, the EFCC said Ajudua, on April 2, 198 in Ikeja, allegedly conspired with Ochunor, said to be on the run, and obtained $268,000.00 from Zalaf of Technical International Limited, a division of Mystic Company Limited in Germany. Ajudua was also accused to have obtained $225,000.00 by false pretence from Zalaf. 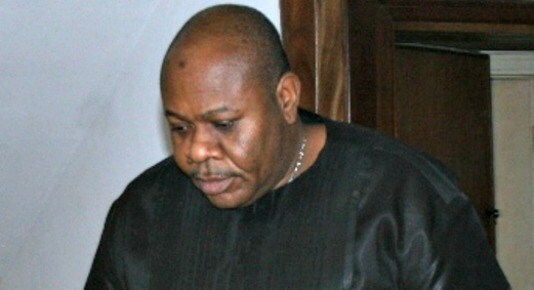 EFCC accused Ajudua of uttering and forging Central Bank of Nigeria (CBN) official receipt numbers 128 and 138, purported to have been issued by the apex bank to Zalaf. “On May 12, he was also said to have forged a Contract Completion Certificate (CCC) purported to have been issued by the Nigerian National Petroleum Corporation (NNPC), Falomo, Lagos, to defraud Technical International Limited. Following the defendant’s plea, his lawyer, Norrison Quakers, through an application dated June 1, applied for his bail. Quakers urged the court to grant his client bail and allow him to continue to enjoy same bail conditions as earlier granted by Justice Josephine Oyefeso in a related charge. The lawyer assured the court that his client would not jump bail. “We urge your lordship to grant the defendant’s bail because he was granted bail by your learned brother. He has never for once absented himself from court except when he was out of the country. “Also, we want my Lord to consider his bail application because of his health condition. “He will need medical attention from time to time and he cannot access that in the prison custody,” Quakers said. Counsel to the EFCC, Mr. Seidu Atteh, opposed the bail. Justice Dada ordered that Ajudua be remanded in prison custody pending the court’s ruling on his bail application.